Connect your mind and body for maximum wellness with this beginner's guide to Eastern and Western philosophies of body movement. 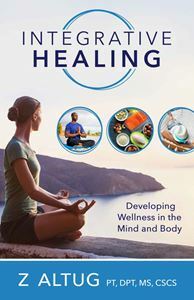 Licensed physical therapist and health writer, Dr. Ziya Altug shows you exactly how to achieve total wellness by incorporating mindfulness and meditative practice into a healthy lifestyle. His book is filled with practical exercise photographs, tables, checklists and charts to help patients and clients track their progress toward their wellness goals. This book is one of the winners of the 2018 Clinician Non-Research Publication Award from the California Physical Therapy Association. Identify major lifestyle factors which affect a person’s health. Identify the different types of mind body training approaches. Describe the benefits of various mind body training strategies. Identify specific practical mind body training techniques. Identify evidence-based strategies for integrative healing. This home-study course describes the best ways to age healthfully and improve your patients` quality of life at any age, including tips on how to cultivate a youthful attitude, safeguard against stress and chronic illness, improve dietary and exercise habits, maximize memory and beef up energy, enhance financial security, and live a long and rewarding life. It is estimated that 1.4 billion adults—one in three across the globe—are overweight. Registered dietitian and health writer Clare Fleishman explores surprising new suspects contributing to our planet’s expanding girth, including air conditioning, drugs, pollution, and others which get little notice as lack of will power shoulders the blame. This important work examines how we live in a new century and why obesity has become a major killer from the American Midwest to the cities of Europe and across the deserts of Africa.